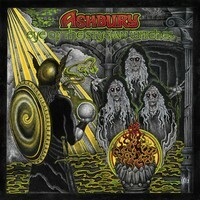 Review: "Ashbury: Eye of the Stygian Witches" - Sea of Tranquility - The Web Destination for Progressive Music! Drawing from inspirations such as Wishbone Ash, Allman Brothers Band, Jethro Tull, Black Sabbath, Outlaws, and Blue Oyster Cult, the music of Ashbury straddles a line that crosses '70s hard rock, Southern Rock, and a touch of folk. Eye of the Stygian Witches kicks off with two blistering rockers that feature the talents of their guitarists Davis & Bujak, "End of All Time" a melodic headbanger with some tasty riffs and plenty of lead guitar, while the more Southern rock flavored "Good Guitar" sees the two axe men launching into some fiery interplay that impresses from start to finish. Davis' passionate vocals permeate the folky "Summer Fades Away", and the delicious acoustic & electric guitar flavors do wonders to the Thin Lizzy sounding "Celtic Cross". "Waited So Long" clocks in at just over 9-minutes, and reminds heavily of vintage Wishbone Ash, multi-part vocal harmonies soaring over crunchy riffs and tasty twin guitar majesty. "Out of the Blue" channels '80s Jethro Tull, and "Faceless Waters" ups the riff-o-rama ante for a prime heavy rock ride. Ashbury dip into majestic blues rock for "Searchin'" and "Amber Glass", and then epic sounding prog & hard rock with the glorious title track, acoustic elements giving way to driving riffs and some wonderfully melodies lead guitar solos. The folky "All My Memories" closes out the album in tranquil fashion, images of Tull again quite strong here. Ultimately, Eye of the Stygian Witches is a really great album, and one that stacks up quite equally with their debut from the early '80s. This is a perfect example of an underground band that deserves your immediate attention!